The word laminotomy originates from the Latin terms lamina - the bony plate covering the posterior arch of the vertebra and otomy - the act of cutting or making an incision. 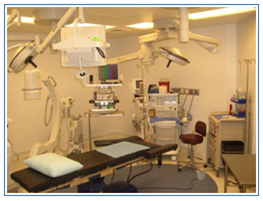 A Laminotomy is a minimally invasive endoscopic approach to opening the spinal canal. A laminotomy does not require the use of general anesthesia and it can be performed in a surgical outpatient setting. A laminotomy is performed to relieve pressure from the spinal canal for exiting nerve roots and the spinal cord. The procedure is performed with an end goal of increasing the amount of available space for neural tissues, and releasing entrapped nerves. A laminotomy can be used to treat bone spurs, pinched nerve, spinal stenosis, disc problems such as a herniated or bulging disc, excessive scar tissue formation and spinal arthritis. A laminotomy is a procedure that can be used to remove the ligamentum flavum. Spinal stenosis has been attributed to this ligament located in the spinal canal. It can naturally thicken to the point that it begins to compress the spinal cord. When a laminotomy is performed the ligament can be removed, freeing or releasing the affected nerve(s). A laminectomy is classed as traditional open back surgery that requires the patient to be placed under general anesthesia. In a laminectomy the lamina is removed to increase the amount of space available for neural tissue. After the patient receives a local anesthetic, a small incision is made in the back and a round Depuy tube is inserted into it. Gradually, a small series of tubes are placed over the initial tube slowly increasing in size to make an opening for access to the spine. The final working tube will be about 18 millimeters in diameter which the surgeon will use to insert the laser, camera, suction, irrigation and other surgical instruments. With this minimally invasive method, the muscles are pushed aside instead of being cut or torn. A laminotomy is an endoscopic procedure and not arthroscopic. The difference being that arthroscopic surgery requires inserting the tubular instrument into the joint, where endoscopic covers surgery with the same instrument being placed anywhere outside of the joint. After the working tube is in place the surgeon can begin the procedure. Many patients that undergo a laminotomy will feel instant relief as the surgeon releases the entrapped nerves. Symptoms of back and leg pain are resolved by decompressing the spinal canal. When the surgeon is finished with the procedure the tube is slowly removed, allowing for muscles to naturally shift back to normal positions. After the Laminotomy is completed the patient is encouraged to take a long walk that afternoon or evening. The following day the doctor will see the patient for a post-operative consultation and give them the authorization to return home. With the advancements in medicine there are a number of minimally invasive procedures one can consider traditional before open back surgery. If a laminotomy is not right for you, other procedures such as a foraminotomy or facet thermal ablation may be.